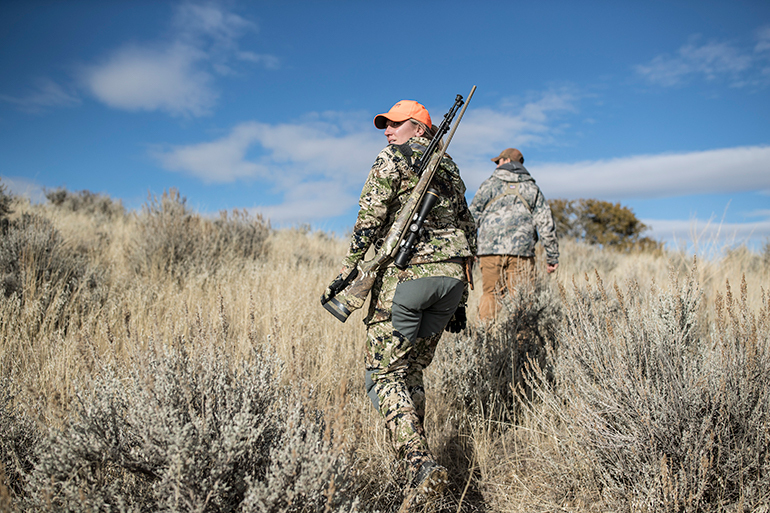 The Weatherby Mark V Camilla Subalpine is a sub-six pound rifle (before scoped) making it ideal for backcountry hunts when every ounce matters. 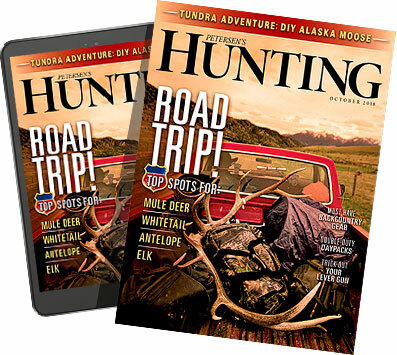 Gone are the days of women hunters having to hit the field with inadequately sized rifles. The “pink it and shrink it” mentality is outdated, youth guns are made for…youth, and using a hand-me-down rifle from your dad is great, but the ill-fit can lead to bad shooting practices. 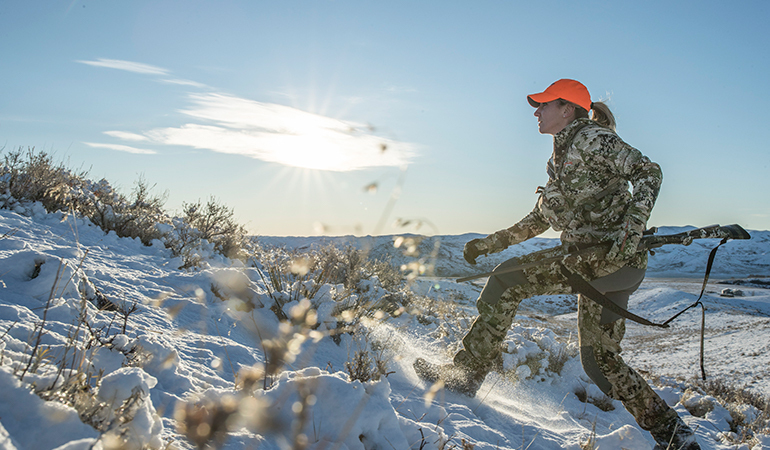 The growing number of women in hunting—11 percent out of the 11.5 million hunters to be exact—has led to a demand for firearms made specifically to fit a female’s anatomy. Weatherby hasn’t ignored this growing need: Its Mark V Camilla is leading the way in women’s firearms. 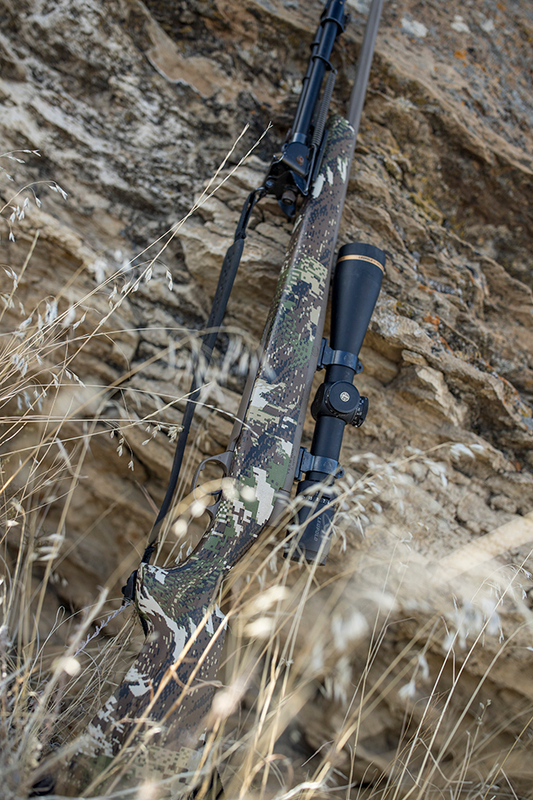 The Mark V Camilla Subalpine is packed with features, starting with the hand-laminated composite stock dipped in Sitka’s popular Gore-Optifade Subalpine Camo. Why Subalpine, you ask? Probably because it pairs with a women’s specific hunting line of clothing from Sitka. A rifle and camo combo designed by women for women. Topped with a Leupold VX-5HD 3-15x44, the Mark V Camilla reached sub-MOA groups at 100 yards and was dead-on at 200 yards. The composite stock is made with an aluminum bedding and features a raised comb Monte Carlo. This detail was made to fit the slim neckline and raised cheekbones of the female anatomy. A smaller grip angle on the stock is paired with a short, skinny forearm, which allows women with tinier hands a tight hold on the rifle, while a right-side palm swell perfects the fit for right-handed shooters. Paired with the stock is a hand-lapped barrel in Flat Dark Earth Cerakote, making this rifle hard to beat up when off the beaten path. Weatherby’s standard 6-Lug Action runs the rifle, as well as an LXX Trigger, and fluted bolt body with 54 degrees of lift allowing it to pair well with most scopes. Made for the backcountry, the rifle weighs a mere 5.75 pounds. You read me right: a sub six-pound rifle. The Mark V Camilla is available in popular calibers, including .240 Weatherby Magnum, 6.5 Creedmoor, .270 Win., .308 Win., and .30-06 Springfield. Much to the dismay of this lefty, only a right-handed stock is currently available for this model. Even though I personally couldn’t enjoy the raised Monte Carlo stock, I found the Mark V Camilla Subalpine to be comfortable. Fit and feel were spot-on, despite the fact that I am above-average size for a woman. At 5 feet 10 inches tall with a wingspan of a 747, I find that women’s rifles and shotguns are generally too short for me. However, when shouldering the Camilla, it fit securely to my frame and allowed for quick target acquisition. A composite stock coated in Sitka's Gore-Optifade Subalpine Camo is paired with a hand-lapped barrel in Flat Dark Earth Cerakote, making this rifle durable against tough terrain. The slim grip and forearm were indeed comfortable and not so slim that would allow the hand to slip during recoil. But I do feel that the grip and forearm could benefit from the addition of checkering as the composite stock does tend to become slippery in foul weather. I opted for the popular 6.5 Creedmoor for my test rifle, and recoil was minimal. The low-recoil round is known to pair well with a lightweight rifle, enhancing the shooting experience. I cannot speak for the other calibers, but from my experience, shooting larger calibers through lightweight rifles, recoil can be something that takes time getting used to. To put the Mark V Camilla to a field test, I headed west to Wyoming to pit it against rutting whitetails. The wide-open, expansive landscape would provide prime testing grounds for the women’s rifle. Rolling hills strewn with sage grass, rocky outcroppings, and a fresh coating of snow would put the aesthetics of the rifle to test, while accuracy would be put into play with both short and long shots across open valleys possible. Before my departure, I topped the rifle with a Leupold VX-5HD 3-15x44 and headed to the range. Running Hornady’s Precision Hunter topped with a 143-grain ELD-X bullet, the Mark V Camilla reached sub-MOA groups at 100 yards. Sighting-in an inch high at 100, the rifle was dead-on at 200 yards, and at 300 yards, the bullet dropped 6 to 7 inches—about average for the 6.5 Creedmoor. Over a week’s time, I toted the Camilla for miles over the rough Wyoming terrain. Snow, paired with blue skies and a hot sun, made for wet and slippery conditions. The Cerakoted barrel held its own despite a few slips on sharp rocks, and the lightweight rifle was easy and comfortable to carry over long days spent afield. 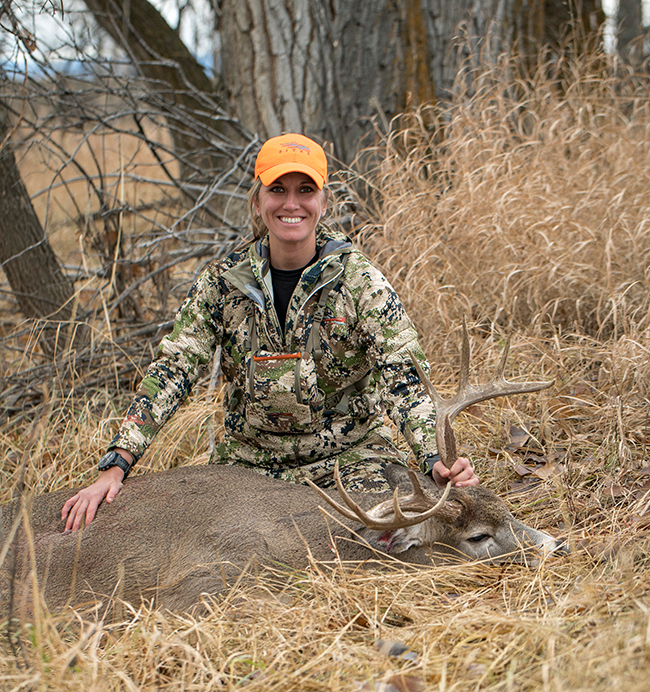 The author with a wide 10-point Wyoming buck taken with the Weatherby Mark V Camilla Subalpine. The Leupold scope stayed true to zero, as proven when I put both it and the rifle to the test on a shot at a buck standing 200 yards away. I lay prone against a rocky outcropping, naturally camouflaged, as I watched the buck chase does across a wide-open field. His rack was wide rather than tall, making him unique. Nose down, he trailed each doe at a sprint, attempting to win them over. The rut was in full force, and his natural survival instinct was the last thing on his mind. As a doe eluded him, he stopped to rest directly in front of my hiding spot. He was perfectly broadside when the crack of my Camilla rang across the valley—dead-on accurate.